Chiswick House020 3141 3351work Historic HouseChiswick House is internationally renowned as one of the first and finest English Palladian villas. Lord Burlington who designed and built the villa from 1725 – 1729, was inspired by the architecture and gardens of ancient Rome and this house is a masterpiece. His aim was to create an impressive setting to show his friends his fine collection of art and his library. The opulent interior features gilded decoration, velvet walls and painted ceilings. The important 18th Century gardens surrounding Chiswick House have, at every turn, something to surprise and delight the visitor from the magnificent cedar trees to the beautiful Italianate gardens with their cascade, statues, temples, urns and obelisks. 2010 saw the culmination of a major project to restore the historic gardens to their former glory, including the Conservatory and its world famous Camellia collection. The Chiswick House Camellia Festival held every year during February and March brings a burst of glorious colour to the winter season. There is also a children’s play area and a modern café within the gardens. Judged to be the best new building in London by RIBA in 2011 the cafe is open all year and offers a light airy space to enjoy a seasonal menu and refreshments. 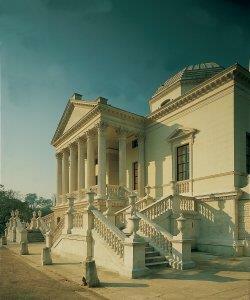 Chiswick House is internationally renowned as one of the first and finest English Palladian villas. Lord Burlington who designed and built the villa from 1725 – 1729, was inspired by the architecture and gardens of ancient Rome and this house is a masterpiece. His aim was to create an impressive setting to show his friends his fine collection of art and his library. The opulent interior features gilded decoration, velvet walls and painted ceilings. Chiswick House once acted both as a gallery for Lord Burlington’s fine art collection and as a glamorous party venue where he could entertain. With exclusive use, the lavishly gilded interiors today provide a stunning setting for civil weddings ceremonies and Chiswick House provides an impressive backdrop for corporate and private events that can be held within the Burlington Pavilion. WCs. Filming, plays, photographic shoots. Weddings, corporate and private events and party hire - please call 020 3141 3351 or email events@chgt.org.uk or see website for brochure. Corporate Hospitality/Functions: Private & corporate hospitality. Suitability for the Disabled guests: Gardens only. Guided Tours: Personal guided tours must be booked in advance. Audio Tours House. (Downloadable tours-Garden). Education/School Visits: Contact Estate Office. Gardens 7am - dusk all year round. Chiswick House 1 April – 31 October Sun – Wed & Bank Holidays from 10am – 5pm. Café Open every day from 9am. Chiswick House ticket prices - Adult: £5.90, Children (Age 5-15): £3.50, Family Ticket (2 adults, 3 children): £15.30, Concession: £5.30, Children under 5 and English Heritage Members: FREE. Group Tours & Group Bookings: Chiswick House 020 8995 0508. Garden Tours and Camellia Festival Group Bookings 020 8742 3905. Turn left A4 westbound after Hogarth Roundabout. Parking available. Tube: Turnham Green and then a 20 minute walk.